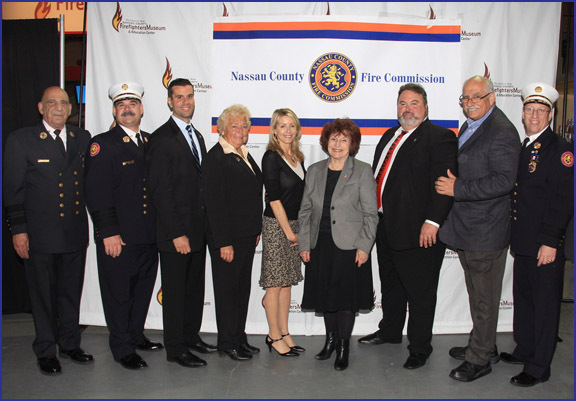 Presiding Officer Norma Gonsalves was pleased to join with her fellow Legislators to attend the Nassau County Fire Commission Annual Firematic Awards Ceremony which was held on Wednesday, April 30, 2014 at the Nassau County Firefighters Museum in Garden City. This ceremony honors members of Nassau County’s Outstanding Volunteer Fire Service for their dedicated service to Nassau County. Pictured L to R: Angelo Catalano, Firefighters Museum Board of Directors; Chief Fire Marshal Scott Tusa; Legislator Michael Venditto; Legislator Rose Marie Walker; Nassau County Legislator Laura Schaefer; Presiding Officer of the Nassau County Legislature Norma Gonsalves; Medical Director of Island Occupational Medical Resources Dr. Jorge Gardyn; Nassau County Legislator Dennis Dunne, Sr.; and Assistant Chief Fire Marshal John Priest.